WataugaWatch: The Rich Are Driving a Billboard Around North Carolina. No Kiddin'! The Rich Are Driving a Billboard Around North Carolina. No Kiddin'! For several days now, Americans for Prosperity NC and the Pope-Civitas Institute have been promoting “a major new effort” entitled the “Real Solutions Road Tour” in which their advocates would "criss-cross North Carolina" to promote their defense of the conservative General Assembly and its extreme policy decisions. To read the various tweets and website posts, you’d have thought there was going to be a long series of well-attended campaign-style rallies with tea partying conservatives coming out of the woodwork at stops throughout the state. Here’s essentially what actually happened on Day One of the tour today: Nothing. Zilch. Bupkis. AFP-NC Director Dallas Woodhouse and “Real Solutions” TV spokesperson Donna King drove a billboard around a handful of cities. In a couple of places they parked and got out, took a picture and went into the local newspaper for a few minutes. In Winston-Salem they parked in front of the building that houses the progressive Z. Smith Reynolds Foundation for a few minutes. That’ll show those liberals! Well, since Rob wrote that report, there has been one local newspaper article in the Lexington Dispatch. It featured a photograph of the billboard-truck (the photo reproduced above), with a group of five people waving. 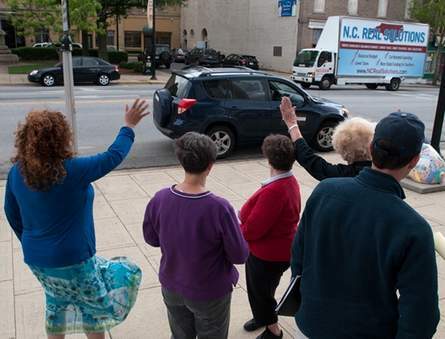 But the caption on the photo makes clear that these folks were waving "sarcastically," because they sure 'nuff don't support the new Republican majority in the General Assembly. What if you drove a Rich People Rule! billboard around the state and no one saluted? JW-I do not know if these people driving the billboard around NC are rich or poor. The billboard shows 4-points;1.balanced budget 2.Lower taxes 3.Cut wasteful spending 4.More state funding for teachers. From your comments I can only assume that you are against these 4-points. Please correct me if I am wrong.